The Council for Scientific and Industrial Research (CSIR) has extended the last date to apply for Joint CSIR-UGC National Eligibility Test (NET). As per the new schedule, the interested candidates can submit the online application through the official website of CSIR- csirhrdg.res.in- till March 22, 2019. Earlier, the last date to submit the online application for CSIR-UGC NET was March 18 which has now been extended till March 22. The CSIR-UGC NETis scheduled to be conducted on June 16, 2019. CSIR UGC NET June 2019 notification has been released. 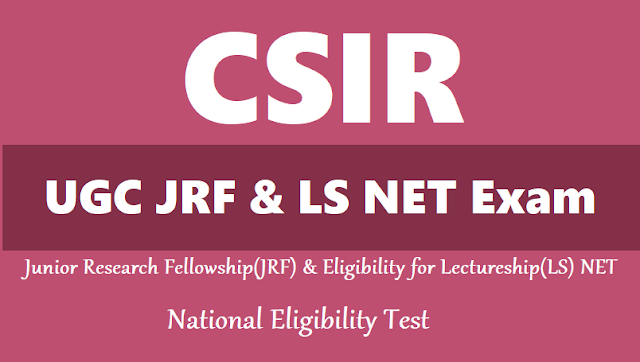 CSIR UGC NET is conducted for determination of eligibility of candidates for Lectureship positions in Indian University/Colleges and for selection of candidates for award of JRF by CSIR. CSIR UGC NET is conducted twice a year, in June and in December. The exam will be a single paper MCQ based test. CSIR awards JRF to candidates holding BS-4 years program/ BE/B.Tech/B. Pharma/MBBS/ Integrated BS-MS/M.Sc. or Equivalent degree/B.Sc (Hons) or equivalent degree holders or students enrolled in integrated MS-Ph.D program with at least 55% marks for General & OBC (50% for SC/ST candidates and Persons with Disability) after qualifying the CSIR UGC NET test. The award of Junior Research Fellowship (NET) to the successful eligible candidates will depend on their finding admission/placement in a university/ national laboratory/ institution of higher learning and research, as applicable. In case of Lectureship, CSIR UGC NET is only an eligibility criteria and means that a candidate must qualify the exam in order to be appointed as a Lecturer. The CSIR UGC NET June 2019 will be conducted on June 16, 2019. Exam for Life Science and Physical Science will be conducted in the morning session and the exam for Chemical Sciences, Mathematical Sciences, and Earth, Atmospheric, Ocean and Planetary Sciences will be conducted in the afternoon session. Interested eligible candidates may visit CSIR-HRDG website (www.csirhrdg.res.in) and see the Information Bulletin for detailed information/instructions from 19.02.2019. Candidates are required to apply online. The online application will be available at www.csirhrdg.res.in from 25.02.2019. Candidates are advised to also go through the ‘How to Apply’ link available on the Online Application portal while filling the form. The last date for applying online is 22.03.2019. CSIR UGC NET 2019: Application Process To Start on 25-02-2019, Exam Tentatively Scheduled On June 16: Council of Scientific and Industrial Research will begin the online application process for National Eligibility Test (NET) on 25-02-2019. The tentative date for the objective test is June 16, 2019. The exam is conducted for selection of candidates for Junior Research Fellowship and/or Assistant Lectureship. The exam will be a single paper MCQ based test conducted over two sessions on a single day. The subject-wise schedule of the test would be declared at a later stage. The exam is conducted for Life science, Earth science, Mathematical science, Chemical science, and Physical science. M. Sc or equivalent degree/ Integrated BS-MS/BS-4 years/BE/BTech/BPharma/MBBS with at least 55% marks for general and OBC-Non Creamy layer candidates (Central list only as provided in National Commission for Backward Classes website www.ncbc.nic.in) and 50% for SC/ST, physically and Visually Handicapped candidates. Candidates enrolled for M.Sc or having completed 10+2+3 years of the above qualifying examination as on 25.8.2019, are also eligible to apply in the above subject under the Result Awaited (RA) category on the condition that they complete the qualifying degree with requisite percentage of marks within the validity period of two years to avail the fellowship from the effective date of award. BSc (Hons) or equivalent degree holders or students enrolled in Integrated MS-PhD program with at least 55% marks for general and OBC (Non Creamy layer) candidates; 50% marks for SC/ST, physically and visually handicapped candidates are also eligible to apply. Candidates with bachelor’s degree will be eligible for CSIR fellowship only after getting registered/enrolled for PhD/Integrated PhD program within the validity period of two years. For JRF (NET)- Maximum 28 years as on 01.07.2019. For LS (NET)- No upper age limit. Part 'A' shall be common to all subjects. This part shall contain questions pertaining to General Aptitude with emphasis on logical reasoning, graphical analysis, analytical and numerical ability, quantitative comparison, series formation, puzzles etc. Syllabus & Scheme of Exam of single MCQ Paper may be seen at CSIR website: www.csirhrdg.res.in. The final result of this Single MCQ test may be declared sometime in the month of September/October, 2019 and fellowship to successful candidates will be effective from 1st January, 2019 with the validity period of 2 years for joining the fellowship under CSIR Scheme. Application form will be available on the CSIR website (www.csirhrdg.res.in) starting 25-02-2019. The application fee for General category candidates is Rs. 1000, for OBC Non-Creamy layer category candidates is Rs. 500, and for SC/ ST/ Person with Disability category candidates is Rs. 250. Bangalore, Bhavnagar, Bhopal, Bhubaneshwar, Chandigarh, Chennai, Cochin, Delhi, Guntur, Guwahati, Hyderabad, Imphal, Jammu, Jamshedpur, Jorhat, Karaikudi, Kolkata, Lucknow, Nagpur, Pilani, Pune, Raipur, Roorkee, Srinagar, Thiruvananthapuram, Udaipur and Varanasi. Tentative date of single MCQ examination: 16.06.2019. CSIR JRF UGC NET 2019 Application process begins @ csirhrdg.res.in: The Council of Scientific and Industrial Research (CSIR) has begun accepting the applications for CISR UGC NET 2019. All the interested and eligible candidates can apply for the exam on the CISR official website- csirhrdg.res.in. Candidates can apply for Junior Research Fellowships (JRF) or Lectureship (LS). A candidate can select his/her preference while applying. Candidates who are eligible can apply for JRF and the lectureship too. In case any candidate is found to be over-aged for JRF, he/she will be automatically considered for lectureship only. Candidates are informed that the last date to apply for CSIR-UGC NET for JRF/LS June 2019 examination in March 22, 2019. Candidates should have 55% marks in MSE or its equivalent degree / Integrated BS-MS / BS-4 years / BE / BTech / BPharma / MBBS. Candidates up till the age of 28 years can apply for JRF NET 2019. An examination Fee of Rs 1000 has to be paid by the candidates. The examination is held to determine the eligibility candidates for the award of Junior Research Fellowships (JRF) and for determining eligibility for appointment as Lecturer in chemical sciences, earth, atmospheric, ocean and planetary sciences, life sciences, mathematical sciences, physical sciences. The award of Junior Research Fellowship to the successful eligible candidates depends on their finding admission/placement in a University/ National laboratory/ Institution of higher learning and research. Notification: It is notified that CBSE will conduct the next UGC-NET for Junior Research Fellowship & Eligibility for Assistant Professor on June 16, 2019 at selected cities across India. Detailed notification will be made available on website www.cbsenet.nic.in.